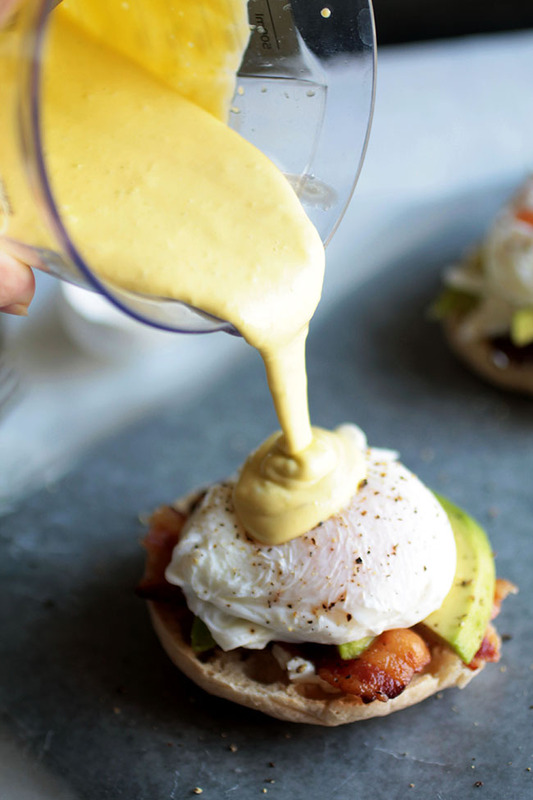 Shake up your brunch routine with this easy Avocado Eggs Benedict recipe! Complete with fresh, creamy avocado and avocado hollandaise, crispy bacon, and goat cheese for a twist on this classic breakfast recipe. Made with a foolproof blender hollandaise sauce! This post contains affiliate links, which means if you purchase something I’ll receive a small commission at no additional cost to you. I can’t stop thinking about brunch. It’s Monday, so I really shouldn’t be thinking about brunch. Buuuuuut I’m thinking about brunch. 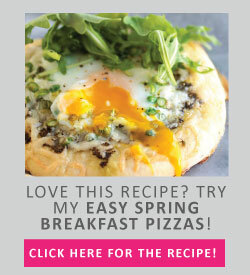 (ALSO HEY PS – It’s hollandaise made in thirty seconds with a handy dandy immersion blender! Which makes it, liiiiiike, quadruple-y cool). And, okay, this dish doesn’t have to be specific to brunch, necessarily – who says you can’t have Avocado Eggs Benedict for dinner, right? (NO ONE. Because that would be ridiculous). So maybe it’s less that I can’t stop thinking about brunch and more that I can’t stop thinking about this eggs benny. (And, um, mimosas. Obbbbbviously). I’ve been on (ok…Captain of) the Eggs Benedict train lately – which has been both awesome and a little annoying. Awesome because I’ve LOVED eggs benny with a capital L-O-V-E-D since a year or so ago when I discovered that I somehow magically no longer hate runny eggs (this was a major life development). Annoying because this blog’s title is not “The Eggs Benedict Blog” (<– although someone should totally WRITE an Eggs Benedict blog) and I have to make things that are, like, “original” or whatever and can’t just inundate you with eggs benny over and over and over again (Or….can I?). My favorite thing about Eggs Benedict is how easy it is. It always looks and sounds so faaaaaancy and commmplicated, but it’s really more about assembly than anything else. 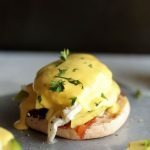 You have to poach the eggs, sure – but that takes all of five minutes once you get the water simmering, and even the hollandaise is ready in no time when you whip it up with a blender or immersion blender. Add a toasted English muffin or biscuit, a protein of your choice (may I recommendddddd…bacon?) and you’re good to go. Your friends and family and brunch guests and taste buds will totally thank you. Easy avocado eggs Benedict with bacon and goat cheese. With a foolproof avocado hollandaise sauce! Melt butter in a saucepan (or in the microwave!) until a thermometer registers the butter temperature at about 200 degrees F.
Blend the egg mixture with the immersion blender for a minute or two until egg yolks have slightly fluffed up and lightened in color. Stream hot butter into the egg mixture a little at a time while you run the immersion blender, letting the hot butter cook the eggs and blending until hollandaise is light and fluffy and all butter has been incorporated. 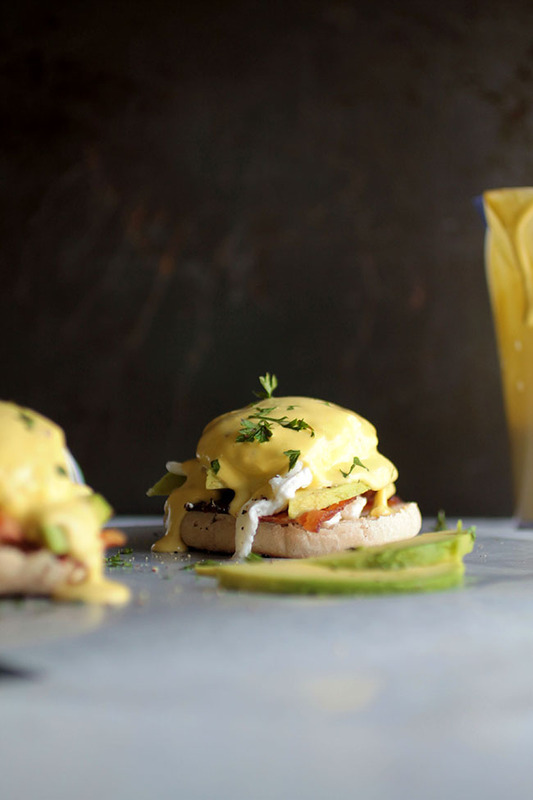 Add a few slices of avocado to the hollandaise – I like to use about 1/4 of the total avocado – and blend until smooth. Taste and add salt if necessary. If the hollandaise gets too thick, blend in a few teaspoons of water to loosen it before serving. Poach eggs in hot water (water should be just-barely-simmering for best results) until egg whites have cooked through, about 4 minutes. While eggs are poaching, toast your English muffin halves. Place each toasted half of English muffin cut-side up on a plate and spread a layer of goat cheese on top of each half. 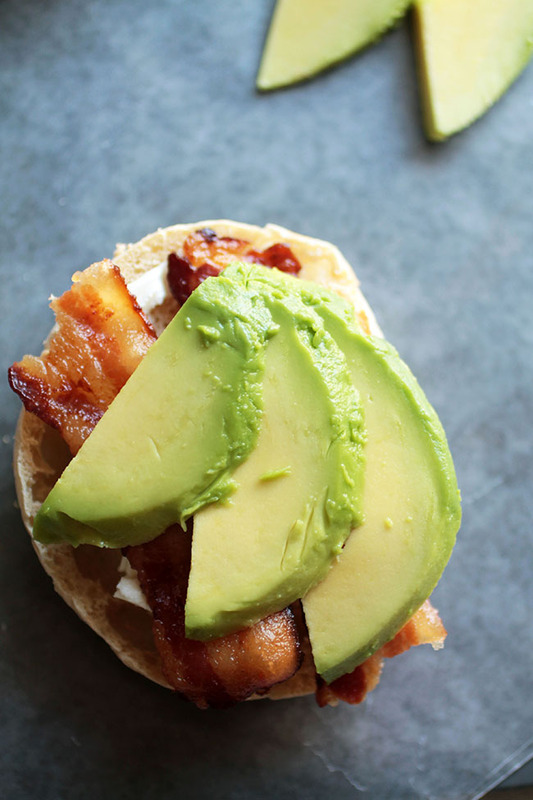 Follow goat cheese with a layer of bacon, followed by a few slices of remaining avocado and a poached egg. Season the eggs – don’t skimp on the salt and pepper! Pour hollandaise over the English muffin stacks and top with a sprinkle of fresh chopped parsley. Serve immediately. Make this with simple gruyere biscuits or vegan biscuits in place of an English Muffin if you like. Don’t have an immersion blender yet? I recommend this one. 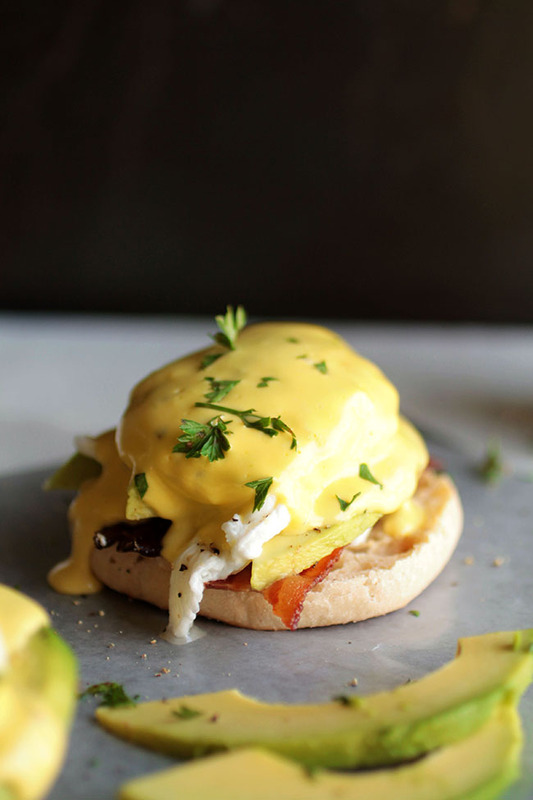 You could also make this hollandaise in a regular blender. Adding avocado to the hollandaise is totally optional – I like to do it because it adds a little extra creaminess and richness to the sauce. 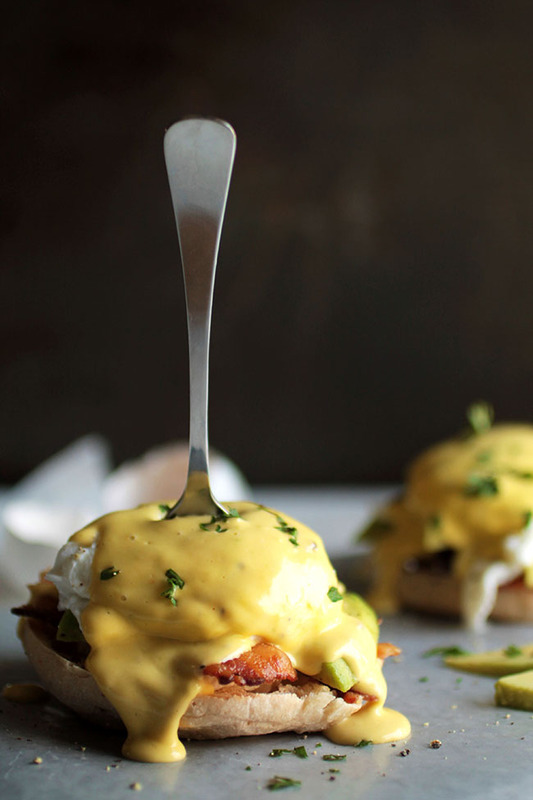 Use extra avocado if you like when you’re assembling your eggs Benedict stacks! I get the best poached egg results when I add a splash of white vinegar to the water before poaching. I also like to crack each egg individually into a small ramekin, then tip it gently into the hot water (rather than cracking eggs directly into the water). Make sure to use a tart, tangy goat cheese here – occasionally, I come across goat cheese brands that are oddly sweet in flavor, and too much sweetness makes this dish a little too rich for me. Use a bright, distinctive goat cheese here to make sure the flavor really pops without overwhelming the sauce! Use brie in place of goat cheese if you like. Made this for Christmas brunch. So delicious. The goat cheese with the avocado hollandsise… wow! I’m so happy you liked it, Dawn! Thanks for letting me know how it turned out! 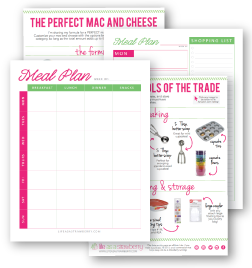 This recipe is one of my favorites and it’s so easy!! My girlfriend and I love eggs Benedict but the avocado takes it to the next level! I make this all the time when we’re craving brunch. Love Love Love! Wahoo! I’m so happy you like it, Ashley – thanks for letting me know! Great recipe! Made for a beautiful Father’s Day brunch. And thanks for the great hollandaise tip, so easy. I’m so happy you liked it, Tracy! Thanks for letting me know how it turned out!